Grandpere is the father of Dad Tiger and the grandfather of Daniel Tiger. Grandpere likes to travel and sail in his boat. 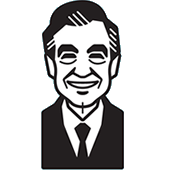 A character named Grandpere was a mainstay in the original Neighborhood of Make-Believe on Mister Rogers' Neighborhood.